President Donald Trump tweeted an endorsement of Roy Moore, who has several sexual misconduct allegations against him. On Monday, President Donald Trump tweeted, "[W]e need Republican Roy Moore to win in Alabama ... No to Jones, a Pelosi/Schumer Puppet!" Alright, quick reminder: Roy Moore is the embattled U.S. Senate candidate from Alabama. At least eight women have accused him of sexual misconduct. Some of those women say they were teenagers when Moore pursued them. Moore denies any wrongdoing. Doug Jones, the Jones referenced in the tweet, is the Democrat in that Senate race, and the latest polling put the men close. 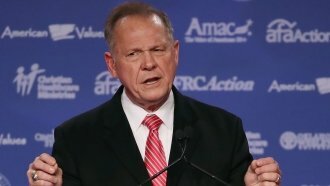 So what's the big deal about a presidential endorsement for Moore? Well, for one, amid the controversy and calls for Moore to drop out of the race, Trump has been largely quiet. That is, until last week. "I can tell you one thing for sure: We don't need a liberal person in there," Trump told reporters in late November. That's not exactly a ringing endorsement of Moore. And to be fair, neither is Monday's tweet. But among Moore's base, it definitely won't hurt. Alabamians vote next Tuesday — just a little over a week from now. RealClearPolitics average of polls has Moore slightly up. A sticking point for conservative voters is likely to be the issue of abortion, which Jones supports and Moore does not.